In this article, I interview the CAMH Medical Director, Dr. McKenzie concerning Dr. Zucker’s previous work at CAMH, the future of the CAMH Gender Identity Clinic, and client-centered models of care. This installment represents the first of five interviews I conducted with individuals intimately knowledgeable about the nuanced differences between Disco Sexology and affirmative care. In order to fact check the claims Dr. Zucker’s supporters began making shortly after Zucker’s departure from CAMH, I interviewed the CAMH Medical Director, Dr. Kwame McKenzie. On January 7, 2016, four days before the launch of the pro-Zucker petition addressed in the last installment of this series, I asked McKenzie to comment on many of the fact assertions Zucker’s supporters would go on to make in their petition. Cristan Williams: A sexologist named Alice Dreger asserted that Dr. Zucker was fired because powerful transgender activists shut down the CAMH clinic. Would you please respond to that claim? Dr. Kwame McKenzie: I can tell you what happened and what has happened. What has happened is that the Rainbow Health Alliance, who are funded by the Ministry of Health and Long-Term Care of Ontario, to increase access to services for the trans population, came to us with a dossier that was produced by a researcher at McMaster University and also expressed their own concerns about our gender identity service for children. The Rainbow Health Alliance are the people we worked with when we developed our successful adult service. I think for people to call [the Rainbow Health Alliance] trans activists… I mean, everybody’s got their own opinion, but in our opinion, the Rainbow Health Alliance are stakeholders and partners in offering services to a vulnerable population. They are located in a health center which is also our partner in offering services. We work with them for adult services, so working with them for child services makes sense. So, that’s how we think about it. They came to us with their concerns. We then [decided that] we needed to get some clinicians to do an independent report. We listen to our stakeholders. We listen to community because we are public servants. It’s unreasonable for public servants to dismiss the people they serve, in our minds. So, we listened, we then conducted an independent review and we then decided that the best way of moving forward in a way that serves this vulnerable population as well as possible is to work with our stakeholders and the community we serve to develop a more appropriate model of care. That’s what we’re doing. For me, any person that believes that it is unreasonable to listen to the population you serve and respond with an independent analysis and then move forward with something that will work for our patient population… Anybody that doesn’t want to do that… I [laughs] can’t see how they can work in medicine because that’s the way of doing things. Williams: I know that this will be an absurd question, but since I see these claims being made out there on the internet… So, it is being asserted that all of this is part of a type of trans conspiracy to further support the expansion of a medical-technical apparatus designed to stamp out gender nonconformity, to do away with gay and lesbian people through compulsory transition in a somewhat similar way to what happens in Iran, and that your actions are yet one more step towards achieving that goal. McKenzie: [Silence] What… Now, what is it that we are supposed to be doing? Williams: [Laughs] Supposedly your actions –getting rid of Dr. Zucker and reevaluating your services– is actually all part of a trans cabal’s master plan. McKenzie: So, we had a clinic and Dr. Zucker was one of the people who worked in the clinic, but there were other people who worked in the clinic, too. The idea is that we’re going to wind down that clinic and so we keep giving support to those who need it and are currently going through the clinic. In the future, we don’t know if we will provide services through CAMH or out in the community. The aim is to continue to give support to people who need the support and to do that by working with the community to ensure that the support is appropriate and that it’s provided in an appropriate space. So, no. This isn’t –in any way– an attempt to decrease the level of gender nonconformity within the community or anything like that. Williams: That makes absolute sense [laughs]. The clinic has faced the criticism that Dr. Zucker was practicing a form of reparative or conversion therapy. However, the independent report said that they couldn’t actually say this type of “therapy” was not being practiced. Would you please comment on that? McKenzie: The review was set to try and work out what was the best thing that CAMH needed to do going forward. The review was not set up to try and work out whether there was or there wasn’t a sort of reparative therapy happening in the clinic; it was a forward-looking piece of work. So, they didn’t have the methodology to say whether reparative therapy was happening in the past or not. Actually, that would be a fairly difficult thing to do. You would have to go back and interview all the people and so it wasn’t set up to do that. So, what it was doing was identifying where we need to work to move forward and what care should be provided. And so it wasn’t… It’s not surprising that given the report’s purpose, it doesn’t move us much forward from where we were a year ago with regard to the reparative therapy question. We had some people saying that it was happening in the clinic and we had clinicians saying that our aim isn’t to do reparative therapy. But, you know, I’ve been looking over these services here for just over two years and what I’m interested in is what the future looks like; I can’t speak to what did or did not happen in the past. Williams: The report mentions that some clinicians had told investigators that they had felt that Dr. Zucker was too conservative with treatment to help people transition. Would you comment on that? McKenzie: I think that one of the criticisms of the clinic… I mean, obviously, the clinic was a pioneering clinic and the clinic has served many people very well and the majority of the people who’ve gone through the clinic have been happy with the service we provided, as far as we know. One of the criticisms with the clinic was that sometimes we were slow to refer people to other support such as puberty blockers and other things. 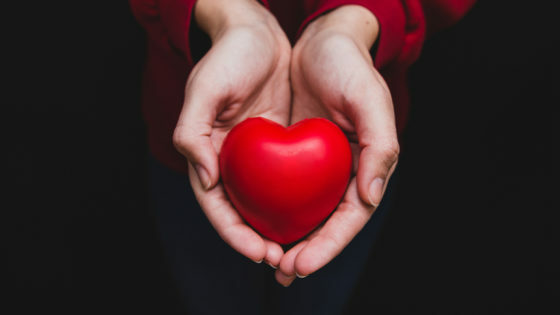 And so, some of the clinicians had basically said, “You know, we could have handled referrals faster.” So, when we’re looking at how to move forward, those are things that we really want to look at because they were saying that we were slower than other clinics to make referrals for services and so, moving forward, we want to make sure that we get that right. Williams: Dr. Zucker has published some controversial research. Can you comment on the clinic’s part in his work? McKenzie: I’m not a specialist on all of Dr. Zucker’s research. At CAMH people have different hats on. They have research hats on and they also have clinical hats on. Mine is a clinical hat. I’m the medical director and I’m interested in the clinical side and doing the best for this population. I think that I always want to see more and better research in any area, but my focus is on this clinic and how we get the best treatment possible. I’m not focused on Dr. Zucker, I’m focused on the clinic and the needs of the population we serve. Dr. Zucker was just one psychologist; we have other psychologists and a psychiatrist there. So, I can’t really comment on his thoughts and his research. I can say that for me, the way I do my research is I always consult the community because I think you get better research and you get better clinical care and you get better outcomes if we’re all working together. I’d love to see some more community-based research on this issue at CAMH. McKenzie: Everybody’s focused on Dr. Zucker and I understand the reasons for that. It’s just that for us, he’s one of a number of people at the clinic and we try to focus on the clinic. So you don’t have to apologize, it’s just the territory right now. Williams: [Laughs] Yes, it’s on the minds of everyone and certainly on the minds of those within the trans community and for so many of us, the clinic and Dr. Zucker was indistinguishable from one another. He seemed to represent a very siloed approach to working with trans people. McKenzie: And that, for me, I think if we’re public servants, we’re public servants and that means that you have expertise, but that expertise is to be used for and with a proper discussion of the people who are paying for you. We’re a publicly funded institution and it’s not our money, it’s your money. So, if we’re going to be doing good work, that work in a democratic system should take our expertise, and add it to community knowledge and come up with an agreed way forward that makes sense. Williams: That makes complete sense. What you’ve just described is the model HIV prevention and care is based upon. Publicly funded jurisdictions work with community to identify both health outcomes and gaps in our prevention and care continuum. This happens at the local, state and national level. What you’re describing is the culturally competent prevention and care system that was produced through years of direct community activism from the 80s and 90s. I mean, in my jurisdiction, a health department’s HIV prevention plan needs to have community endorsement as a measure of our jurisdiction’s performance. So, for me, the care model you’re describing is entirely appropriate. McKenzie: Things have changed in the world, aye? [Laughs] We’ve moved on from those insular systems. Williams: What are your hopes for the clinic going forward? McKenzie: So, first thing’s first: the resource and commitment of CAMH is not lost. So, we’re going to stay in the business of helping kids who are dealing with gender issues. My goal is to make sure that resource stays. Now, the question is where should it be and what should it look like? That’s the thing that will be negotiated and discussed with stakeholders. Does it work for other clinics? Does it work for other community partners? Does it work for the trans community? What I can tell you is that this will be a proper process whereby we’re going to be open and look at answering the question of, ‘What is the best thing to do?’ That’s where this process is starting and then we’re going to move forward from there. So, it’s not “CAMH is shutting down,” or that we’re not going to do anything. We’re going to provide care, but when we started working with the adult population, that population wanted to receive services in a different location and those accommodations are fine with us. We’ll look at funding allocations and that’s a different thing again. What does that look like? Should it be in the community, should it be a team that moves around as opposed to patients that come in. There are loads of different ways of moving forward. So, the main thing is to get people talking. Patient invitations to the first meeting will go out in early January , and the next meeting will be scheduled shortly after that. McKenzie: I don’t know any trans women that that would apply to! McKenzie: [Laughs] I’ve never met a trans woman that that would apply to. I’ve not heard that before but, all I can say is not the trans women I know! Williams: I had to ask because your clinic was attached to the promotion of that idea in the past. McKenzie: What we want to do, when we move forward, we were very clear that if you want a fresh start and contemporary thinking, you’ll need new leadership. And that’s the aim; that’s what we’re going to do. We’re going to have new leadership. I don’t think that we’ll be going down the same model of a very strong charismatic leader who everybody follows. I think that we’ll be trying to work out how you can organize a clinic so that it properly reflects a variety of contemporary views that are trying to think about what people need. There are loads of different ways of going about that, and I’m not saying that this is what we’re doing to do, but some people set up advisory groups and make sure that they’re balanced. Others set up regular reviews so that every year or two look at what’s happening. I’ve worked in an outpatient setting in the UK where every six months we had an appraisal and that appraisal was from the clients and their relatives. So, every six months they came in and told us what we were doing well and what we were doing badly. That clinic won awards and we won awards because we were providing client-centered care. So, there are loads of ways of ensuring, in a modern way, that people are properly served and that clinics deliver the best client-centered care possible. I’d be very excited if, going forward, throughout Ontario we had much more transparency and much more user involvement in defining what our services look like. If we can do that here, in this clinic, that would make me quite happy. Dr. Blanchard sharing TERF propaganda, specifically targeting this series. 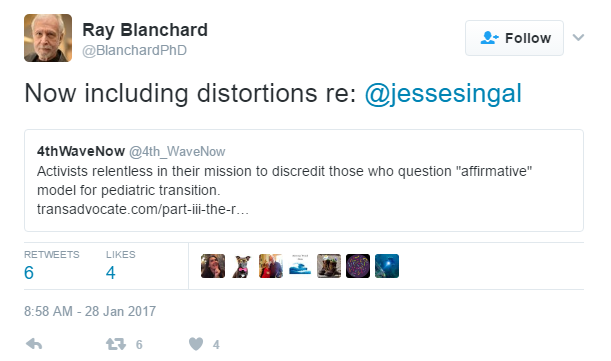 Dr. Blanchard promoting Disco Sexology’s unproven postulation that the way trans people experience their bodies can be prevented. I reached out to CAMH for comment regarding Dr. Blanchard’s behavior and whether his international media appearances promoting Disco Sexology impacts the clinic’s asserted commitment to contemporary best practices. As of the date of this installment, CAMH has not offered an on-the-record response. Should CAMH elect to go on the record, this installment will be updated. UPDATE: CAMH made it clear that Dr. Blanchard is no longer with CAMH and has, in fact, retired.